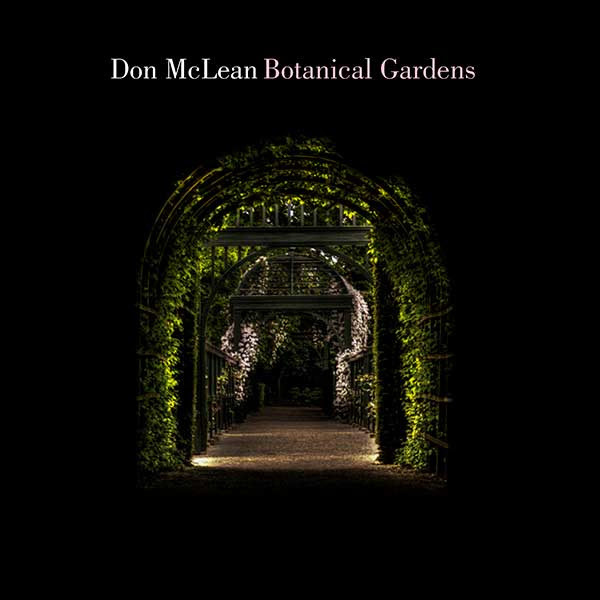 DON MCLEAN SET TO RELEASE NEW ALBUM BOTANICAL GARDENS MARCH 23 | 2911 Enterprises, Inc.
Iconic American singer, songwriter and performer Don McLean is set to release his new album Botanical Gardens on March 23, 2018 via BMG. Don is set to appear on BBC Breakfast Thursday, March 15 along with multiple BBC radio stations and Absolute Radio in the U.K.
Don is profiled in a new episode of Heartland TV’s More Than The Music airing Tuesday, March 20 at 8:00pm ET/PT as well as Heartland’s Roku channel and online at watchheartlandtv.com, with an encore viewing Sunday, March 25 at 8:00pm ET/PT. On March 21, Don’s hometown of New Rochelle, New York will have its own piece of “American Pie” when the world-renowned singer and songwriter will dedicate his existing plaque at the city’s Walk of Fame in Ruby Dee Park at Library Green. The ceremony is open to the public, beginning at 4 PM, and will be hosted by Jennifer Lanser, Executive Director of the New Rochelle Chamber of Commerce. Later that evening the city will honor McLean with a Lifetime Achievement Award at their annual Dinner Dance and Awards ceremony at 7pm. For more information or to RSVP, contact the New Rochelle Chamber of Commerce at info@newrochamber.org, infonewrochamber@gmail.com, call 914-632-5700 or visit newrochellechamber.org. Don then returns to New York City with appearances scheduled at ABC News Radio, WABC’s Bernie & Sid, iHeart/Premiere Radio Networks, Fox News Radio, United Stations, LifeMinute, and more, ending the week with a performance at City Winery Friday, March 23. Botanical Gardens, his 19th studio album and first in 8 years, is arguably one of Don’s most reflective to date. As he characterizes it, “The inspiration for the project started years ago when I would walk in the beautiful gardens in Sydney, Australia near the Opera House. I would dream young dreams and it was a comfort and an inspiration. I was always young inside, like we all are, and I felt it again there.” Further reflecting on the record, Don says, “the whole album really revolves around the title song. Later on I realized that the gardens are really a metaphorical heaven, and there’s a kind of death and rebirth. In nearly 50 years, Don’s songs have become an iconic staple of American music. His music has been performed by artists as diverse as Elvis Presley, Madonna, Fred Astaire, Drake, James Blake, Ellie Goulding, Chet Atkins, Garth Brooks, Weird Al Yankovic, George Michael, Josh Groban, Coolio and Ed Sheeran. A New York native, Don McLean is one of the most revered and respected songwriters in American history. After paying his dues in the New York club scene in the late ‘60s, he went on to score mega-hits like “American Pie,” “Vincent (Starry, Starry Night),” “Castles in the Air” and many more. In 2004, McLean was inducted into the Songwriters Hall of Fame by country superstar Garth Brooks. “American Pie” has brought great happiness and hope to millions of people through the years and continues to be honored for its success. In 2000, the song was named one of the Top 5 Songs of the 20th Century by the RIAA and in 2002 was inducted into the Grammy Hall of Fame. 2017 brought a huge honor when the iconic song was inducted into the Library of Congress’ National Recording Registry, joining less than 500 works including “Somewhere Over the Rainbow,” classical music compositions, infamous live broadcasts and similar recordings. McLean continues to tour both North America and abroad bringing a mix of his classic hits with an array of new works.